Is There Such A Thing As Too Much Track?? but holy that is a big setup. has anyone ever built a massive track and decided it was too big? Carrera digital 1/32. I'll post pics once it's operational. i still have to finish building the table. I like longer tracks if they are home tracks they are good to practice on and improve your skills. Also if it is a track you are driving a lot you will want the challenge as a small track will get old unless you race on it. I assume this track is mainly for you family and friends and not used as a club track. If this is the case go for it. If you were looking for something to be used as a club track for racing you would need to consider marshalling the track. cheers gents, it is just a private track. Carrera digital 1/24 scale track running 1/32 scale cars. One thing to remember is to allow for borders, especially on outside of all curves and inside of tight ones such as hairpins. The tail of a car cuts in at slow speed. DO NOT set it up permanently to start of with, there will be some corners you hate and will want to change a well as some areas that are not as visible as you thought would be and some parts of the track that are either boring or just to much going one all at once. I've leant from my mistakes previously. If you get into it and do not have a club close by, look at trying your hand at some proxy racing. You build a car, test a car, tune a car, test a car, tune a car .... then post it off to have others drive it and see what they can get out of it along with numerous other cars on various tracks around the country and worldwide. If you're lucky it comes back in one piece. thanks mate, i wouldn't have thought of setting up temporarily to see how it goes, i will now. Hi Tim, wow, that is a lot of Carrera track. I second the idea of setting it up temporarily and trying it out. 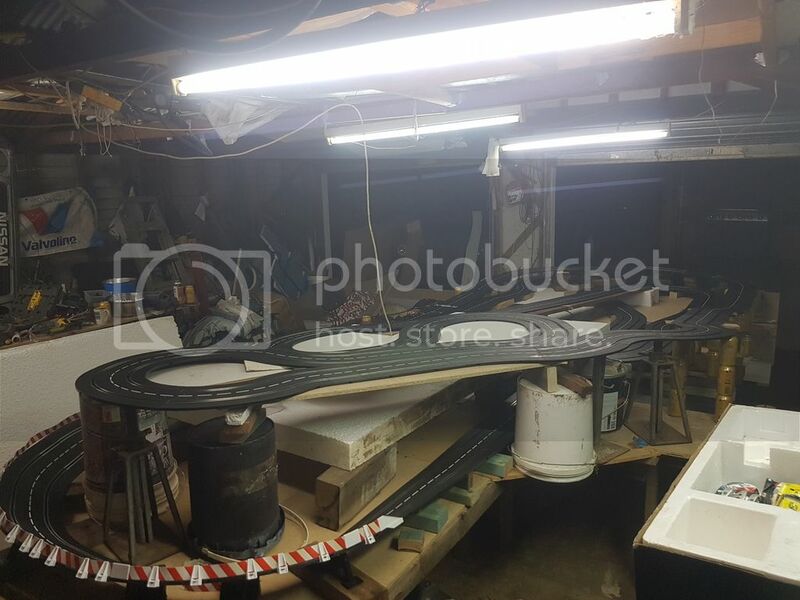 Plastic track lends itelf to all sorts of possibilities and what looks/seems good on a plan can drive completely differently to how you anticipated. A lot of people set out a track without borders and regret it later, so leaving room is not a bad idea. Leaving room for a longer pitlane (with at least one extra straight section) might be an idea as well. Very technical sections need to be tested by driving because they can become frustrating if they don't drive well and its impossible to tell until you do. I see you like overpasses, they can be fun but a bit of work to build (depending on whether you have the plastic factory risers or if you build from wood) so find a simple way to make lots of them with as little effort as possible so that changing things around does not become a problem. (I will look for pictures of what I am talking about. I built a bit of a longer overpass construction that was not easy to modify later on) Is that softybahnplaner that you are using? Its pretty cool hey. 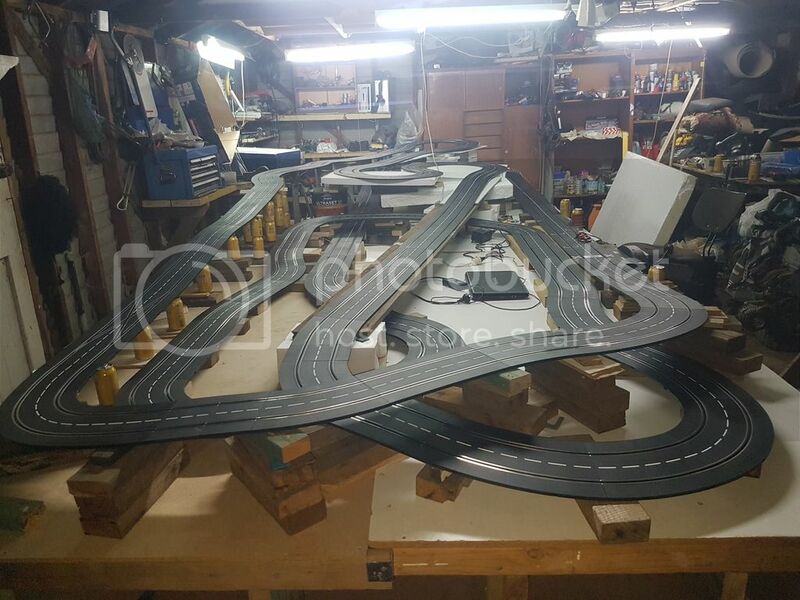 Also if you want to look at a large but well thought out Carrera layout, I will try to find you some pictures of Bruce Yingling's layout, he's developed it over the last 10 years, he's from the US, and is on a different slot car forum. 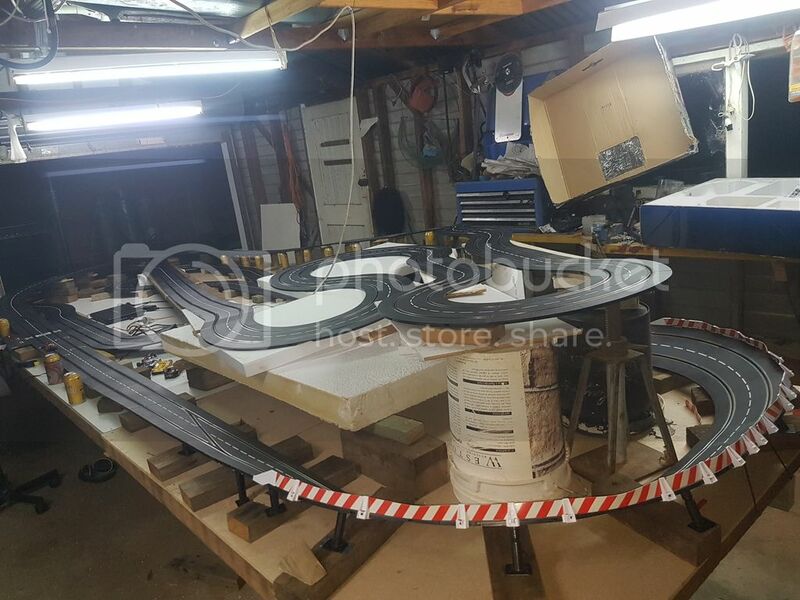 Often track designers for plastic segmented tracks will pack in so many turns and short straights the flow is lost.......proabably done to sell more track pieces. I agree with munter here and you have proven that with your design. Been there and done that: usually when one starts in this hobby has the tendency to pack as much track as possible. it took me a while to realise that flow is more important than track length. Avoid to have too many layers and only have one overpass at most if you want to equal lane length. 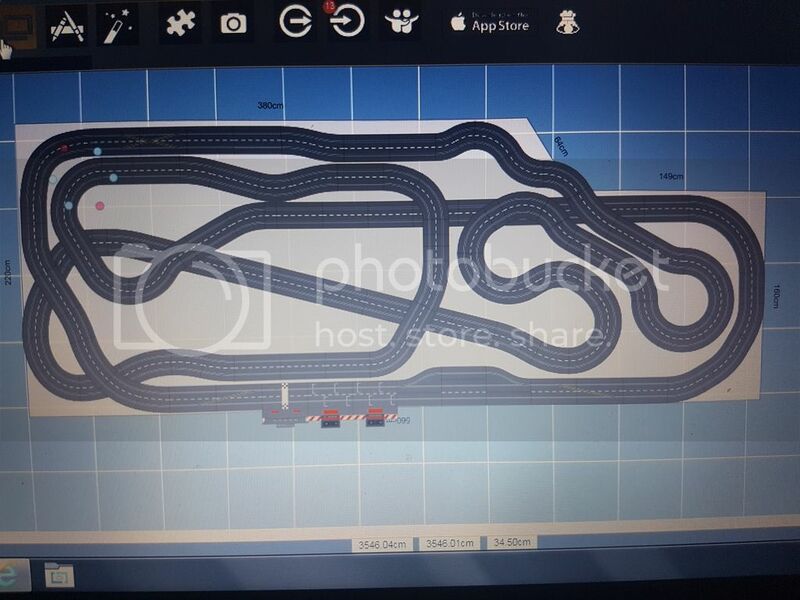 The two most recent replies are good advice, but since I promised to provide a layout of a large track, here it is. This is taken from a facebook post by Bruce Yingling (shared here with his permission), there is an old video of his layout on youtube https://www.youtube....h?v=NWfNTSmnbSI, but its different now. 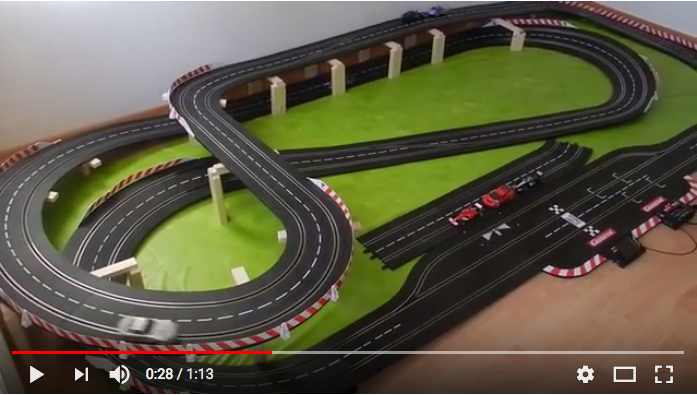 (Think the video was made by then president of Carrera Toys USA, Dave Kennedy) To be honest, I like curves, but not too many wiggles that people put into the middle of straights, but again, you can never tell until you drive it! "Made a change to my layout today. When I switched to the overpass track a couple of years ago, I didn't realize how awkward the placement of the lane changer area in the middle of the track was going to be when racing. Tricky to drive and still take the lane change. Punch coming down the hill, release, punch, release, punch and squeeze the button as you release going into the turn...phew!!! It couldn't be done well with most cars. The elevated, sloping lane changer was also problematic, especially with heavier cars. The return lever would slip to a jammed position and have to be freed with a screwdriver. So now there's a single decreasing radius turn and the lane changer lays flat. I only drove a few laps tonight, and only with one car, but I think it will be a welcome change." And here is just one method for raising the track for overpasses... I would do it a bit different but here is something that can be reconfigured fairly easily. If you plan on having overpasses, get your mitre block and a sharp (yes, I mean it) tenon saw ready. Maybe hot glue the supports in place until you know its how you want it to stay. No idea who took this photo, I pinched it off you tube.  Edited by Slotspeed, 22 March 2019 - 09:55 AM. That kink in the top left corner...why? Wondered the same thing myself. Maybe its something he found that works somehow to make it interesting. I also wonder why people put chicanes and crossovers in, the little wiggly stuff annoys me! I always wade in when plastic track is mentioned here, cause I still regret every cent I spent on plastic track. Expensive, connectivity issues, power taps, expansion/contraction with weather = a royal pain in the behind. Was good being able to change the layout around, but much prefer my routed track, now I have had both. Routed MDF timber track is generally cheaper to build, so much smoother, less movement with seasons, and power is consistent across the whole track. Don't know if you plan to run magnets, but for racing magnet free with a group you can't beat routed tracks. Over complicated plastic layouts generally are a pain to maintain, and result in the track owner having a massive advantage over other racers. You will get bored flogging other racers. KISS is the best theory for good race tracks. Helps new racers learn the layout quickly, and less offs/marshalling overall. Please don't let me dampen your enthusiasm, but thought it worthwhile mentioning my experience - consider a routed timber track if you haven't already. it's operational!!! pics and a vid in the morning. Edited by tim_pato, 23 March 2019 - 07:50 PM. very rough temporary setup. I'll drive it for a while and make a few changes before i start on the scenery. i will have to up the voltage but i might try adding a few more power extensions in the mean time. it's not too bad though. No such thing as too much track however, there is a thing called "not enough room"
If you desire a great scenic layout(and I think you do), then the area needs to be clutter free first. As said before, allow space for drivers and marshalls. Scenery takes up space, pitlane, spectators areas so forth. Large screen tv with race progress is a must. You're on the right track just take your time and get it right 1st time. Nice job getting it set up so quickly to test your layout. I've also been on the lookout for used Carrera track, still impressed with the acquisition, it dosen't come up all that often. Having seen other guys on forums and on facebook who have recently built scenic layouts and then later wanted to try going magless and found out that they can't do much without hitting the scenery, I still think you should consider leaving some room for borders before you start on planning your scenery. Once you've built up your scenery to the track it will be too late to go back. Even with super sticky tyres you will need at least 40mm extra width for comfortable racing with self made MDF borders, ideal 50mm for 1/32. The 60mm factory borders will be far too expensive to buy the quantity required for your layout! But I can see with such a layout it will be a lot of fun for a while before you start to want to try running without magnets. So up to you of course. Magless does less damage to scenery (and cars) than magnet racing.